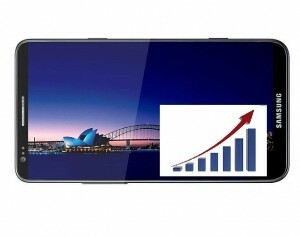 During the launch event of the Samsung Galaxy S4, no specific pricing or release date was set. But a little digging and an educated analysis told me it would drop in at $570.00. OK, it wasn’t really education that helped me determine that price, it was the contest rules laid out by Samsung. Samsung is running a Cut To The Front Of The Line contest, wherein you can win a new Samsung Galaxy S4. In the official contest rules, there is an estimated value of the prize. That value was stated at being $570.00. Sounds like a reasonable price for a Galaxy phone. The plot thickens however. The contest rules have been updatied with a new estimated value of the price. Updated to the tune of a $70.00 increase, coming in at a new retail price of $650.00. That’s right in line with the Apple iPhone 5, what a coincidence. Samsung obviously thinks of this as a premium phone, and has set a premium price for it. And sitting side by side with a similarly priced iPhone 5, I’m not sure which one consumers would pick. Given the current trend, I’d say the Samsung Galaxy S4 would come out the winner. To me this says that carriers have the option for setting their own price. A price war between carriers would be a good thing for consumers, as long as you would be happy jumping to a new service provider to get a lower price. Keep in mind too that this is off contract pricing, and not carrier subsidized. Subsidized pricing will probably be in line with other similar available phones, either $199.99 or $299.99 for a two year commitment. 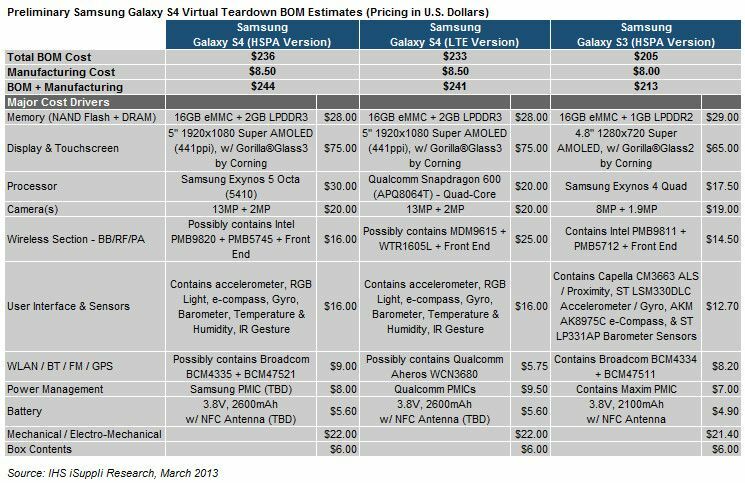 IHS recently did a breakdown on the cost of materials to build the Samsung Galaxy S4. It comes in at just over $230.00 for the LTE and HSPA versions. The display itself costs $75.00. That’s $31.00 more than the iPhone 5 Retina display. Below is a chart showing the breakdown of all costs, and comparing them to prior versions. Regardless of the cost, I’m sure the Samsung Galaxy S4 is going to be a hit. Is this the iPhone killer? I’m not sure, but it’s going to be close. What do you think? ?